This book contains background and Setting Rules to create action-packed sci-fi adventures in The Last Parsec. Learn about the Known Worlds, their sapient races, JumpCorp operational details, and a dazzling assortment of galactic personalities - plus new gear, vehicles, and even an adventure generator you can use to inspire your own journeys into deep space! 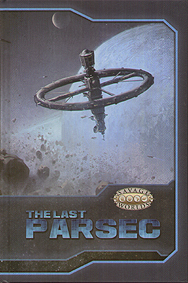 The Last Parsec is a setting book for Savage World. It requires the Savage World core rules and the Science Fiction Companion.